Fishing the last week has seen some ups and downs for walleyes. Looking back, 4 of the last 6 days have been pretty good, mon. and tue. were a struggle for our boat on walleyes. We have had good action on other fish when pursuing them. Smallmouth on 8-10' humps they are really starting to like the extra large fatheads , gills on cribs and deeper rock/wood bottom, occasional crappies on deeper wood and some random perch on various depths and structures. The water is still warm, it is slowly dropping even with the warm sunny days, the longer cooler nights are starting to overcome the sunny days. The last few days the minnows have edged out the crawlers, though last weekend with two days of a good south wind we found action with a summer like pattern catching walleyes on 8-10' humps with crawlers. The fall bite is slowly starting to emerge, yesterday between a morning group and an afternoon group I lost count around 45 walleyes we ended somewhere around 50. A lot of these fish are small undersize fish but are fun to catch jigging, both groups brought in keeper size walleyes and other fish. The weather has been amazing, pretty easy to take for late sept. early Oct. The leaves are (my estimate) at around 30-40% in color with the best fishing and fall colors yet to come. The water level is around 3-1/2' below full pool (thanks Tom for the link). Last year the water level remained high, most years however in the fall this a pretty typical fall water level. I remember not too long ago 5-7 yrs. ago? 5' below full pool. In previous posts I have mentioned some of the areas where there are a lot of deep attached trees, on a 5' drop year people would be surprised what they are motoring over. Again between grassy island and mud lake, west of Fisherman's, big area in front of F-16 and a lot of stuff outside of the river channel from north of Bastine all the way north to the falls. Drive slow, pack a lunch or better yet a fillet knife(fish eaten are part of your daily bag), utensils and some fire wood, enjoy the scenery and the fall fishing. 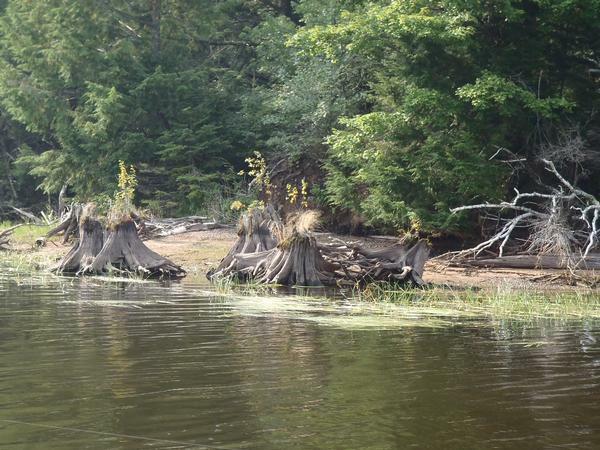 There is an upside to the low water, imagine 3' of water over the stumps on this island point, waypoint 1021. Someone asked about Gateway Bass brawl, the first two places had nice catches of fish: Morgan/Aho 11.71 and Barto/Rhunland 10.87, congratulations that was before the bass started biting again! Have been really busy but do have sat and sun open if interested give a call it will be the prettiest weekend of the year. Thank you to everyone who chose my guide service!